If I had the web coding skills, I would have this post playing “Everybody’s Working for the Weekend” to help get you as pumped as I am that Saturday’s here. Alas, I don’t. So we have to settle for a YouTube clip. Do you find yourself “working for the weekend?” I know I do; there’s finally time to recharge, catch up on a few things around the house, and make some time for fun. Unfortunately, many of us – myself included – often feel like we don’t make the most of our weekends. Perhaps we wish we’d caught up on sleep, spent more time with friends, made it to the gym etc. Can you relate? 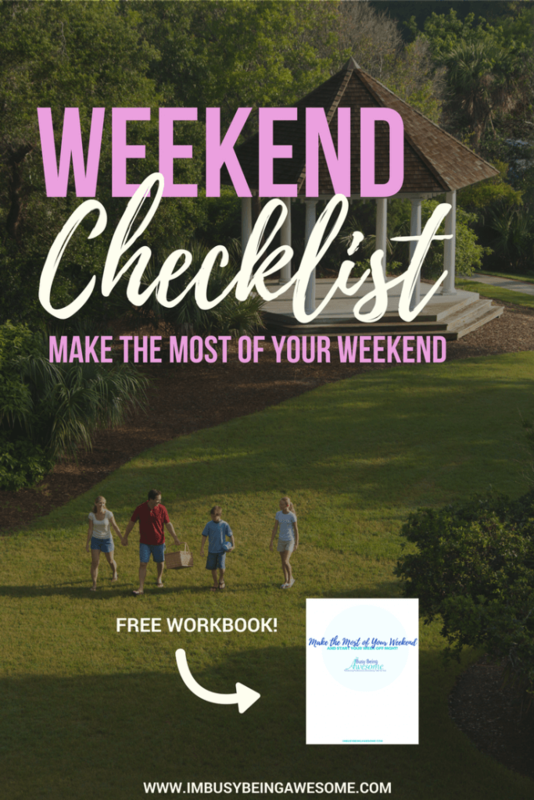 Since I often feel like the weekend “got away from me,” I thought it’d be helpful to create a weekend checklist – a guide, if you will – that helps us make the most of these 48 hours. In turn, we’ll start the next week feeling refreshed and ready to go. I’ve broken the checklist into two categories – Recharge and Organize – because both are necessary to help you start the week off right. So if you’re ready to make the most of your weekend, read on! This post is just for you. While this promise of “catch up” might seem promising on the surface, sleep experts recommend sticking to a consistent sleep routine for both the weekdays and the weekend. Why? So you don’t mess with your circadian rhythm; doing so only makes it harder to fall asleep the next night. With that being said, if you are a person who gets less than 7 hours of sleep on weeknights, that doesn’t mean you should maintain that minimal time on the weekends as well. Rather, go to sleep a bit earlier to ensure you get the 8 hours of rejuvenating sleep you need. If you’re new to I’m Busy Being Awesome, (welcome!) you might not be familiar with my advocacy for self-care. For those of you who’ve been reading for a while, however, you’re probably not surprised to see self-care second only to sleep on my weekend to-do list. You don’t need me to tell you that for many of us, our work week is full of daily stress: the rush hour commute, countless meetings, encroaching deadlines, after-school activities… you name it, it’s probably on the schedule. When we continue at this pace throughout the weekend, and we pack each minute with activities, outings, kids’ soccer games, etc. we never have time to slow down and look after ourselves. Obviously, this is not an ideal situation. If you’re a schedule person, (and if your weekends are packed, I’m guessing you are) make sure you include self-care in that schedule, too. Think about what helps you recharge, and what brings you joy. Highlight at least 5 happiness boosters, and then make sure you tend to 3 of them every day. Different people have different ideas of self-care, of course. While one person might enjoy writing their thoughts in a journal, another might prefer going for a run. The important thing is highlighting what makes YOU feel good, and setting aside time to do it each weekend. Practicing self-care on the weekend will help you release much of the previous week’s stress, in turn clearing your mind for what the next week brings. Though perhaps less enjoyable than sleeping or self-care, taking time to get yourself organized is another great way to start your week off right. I know many people who prefer to save this stuff for Sunday, while others like to space it out throughout the weekend. Whatever time frame you choose, be sure to include these tasks in your weekend routine; when you do, you’ll face Monday feeling ready and raring to go. Meal planning has been a game changer for me. While I used to come up with creative new menu ideas for nearly every day of the week, over the last few years I lost that drive. Between getting home too late, feeling exhausted, and not having the right ingredients lying around, meal time got pretty boring around here. As part of my New Year’s resolution to find work-life balance, however, I started planning, shopping, and prepping for a weekly menu. My “plan and shop” happens Saturday morning after the gym, and my prep unfolds on Sunday. Admittedly, my prep is nothing elaborate, but it works for my husband and me. I pull out my slow cooker to make up a bunch of chicken, I cook a pot of soup, and I brown up some ground turkey. I then section everything into meal-sized portions to either refrigerate or freeze. With this approach, when it’s time for dinner, I can simply heat up the soup, add taco seasoning or marinara sauce to the ground turkey, turn the chicken into fajitas, or serve it over a salad, etc. It’s mealtime in minutes and doesn’t involve frozen pizza or a delivery person. Not too shabby. Between my love of bullet journaling and my Happy Planner, it’s probably not surprising that I’m a huge fan of planning out my week. I often do this in my bullet journal by first listing the week’s major tasks, todos, and appointments. Then, I break the master to-do list into parts, and I divide it up amongst the week using my strategy of time blocking. It is an easy way to feel prepared, and it also helps prevent any unexpected (and unpleasant) surprises. Whether you’re a bullet journal lover or happy planner fanatic, check out my planner inserts and stencils to help map your week in minutes! I don’t know about you, but by the time Saturday rolls around, my hamper is looking pretty full. And while I used to delay doing laundry until it was absolutely necessary, it only took one Monday morning with nothing clean to wear that I started making Saturday my laundry day. I just throw a few loads in the wash as I do my thing around the house. And if I’m feeling particularly lazy and do not want to put away my laundry (read, every week) I still have Sunday for that final step. If doing the laundry isn’t on a regular rotation, try adding it to your weekly schedule. It’s so much easier to start the workweek knowing you have fresh, clean clothes waiting for you. And that’s it, friends! If you’re ready to make the most of your weekend, just follow these five simple steps: get enough sleep, take time for self-care, plan out next week’s deadlines, todo list, and meals, and get that laundry washed. You’ll be recharged, organized, and prepared for the week ahead. Want to really crush your weekend? 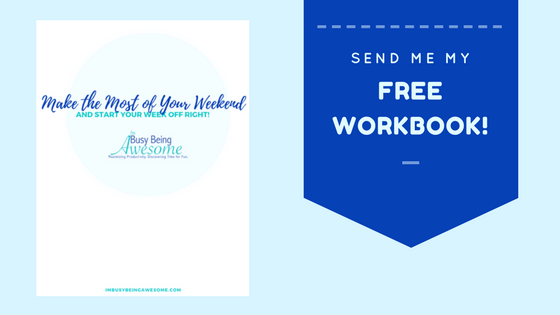 Download this free weekend planner! It helps you plan your sleep schedule, highlight your self-care goals, arrange your menu and shopping list, and map out your to-do list, all to ensure you make the most of your weekend. What do you like to do on the weekend? Do you stick pretty close to your regular sleep schedule? How do you make the most of your weekend? Let me know below! That sounds like a fantastic weekend! These are all such great ideas! I love using the weekends to grocery shop and get organized! Yes! Me too. It’s such a great way to catch up and get prepped for the week. I try to make time for me time on the weekend. Even if it’s just my morning coffee session, I enjoy what I can. All this and I try to digital detox for 24 hours when I can. These are great tips! I definitely sleep in on the weekends! I also try to be very productive on Saturday, lots of laundry, cleaning and errands. On Sunday I relax more and spend time with my family. That’s fantastic 🙂 I love that you take a day for family time. 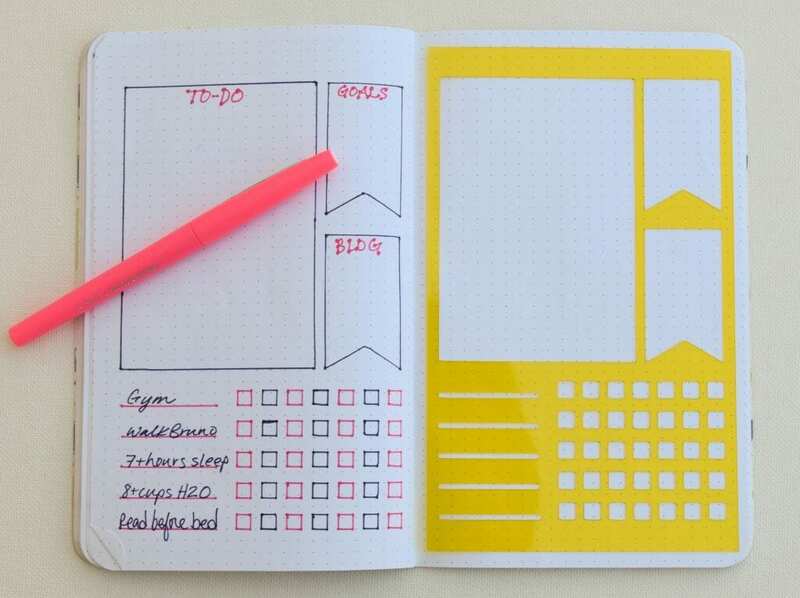 Those bullet journal stencils are pretty much the best thing I’ve ever seen. Thanks for sharing that link. Thank you so much! Yes, self care EVERYDAY. It’s so critical for our wellbeing. I wish I could get more sleep on the weekends! I often stay up later than normal, and then my two toddlers wake me up at their normal morning time, so I end up getting less sleep. Grocery shopping and doing laundry is definitely something that my family does every weekend. As a SAHM, one of my favorite things to do on the weekends is drop my kids off with family or at the drop in daycare, and then spend a couple hours going on date night with my husband. Fantastic advice! At 50, I’m finding that days and weeks (OK, years, too!) just whoosh by faster and faster. That goes double for weekends! It’s always so much more satisfying to reach Sunday evening knowing I squeezed every drop of weekend goodness out and savored it! I definitely don’t stick to my sleep schedule on the weekends since I like to use that time to recharge as you say! However, I tend to stay up later to get the most out of the weekend productivity wise! I use it mostly to plan for the upcoming week and much needed R&R! Great ideas! I hope I can utilize them this weekend. What a great post Paula…as always. 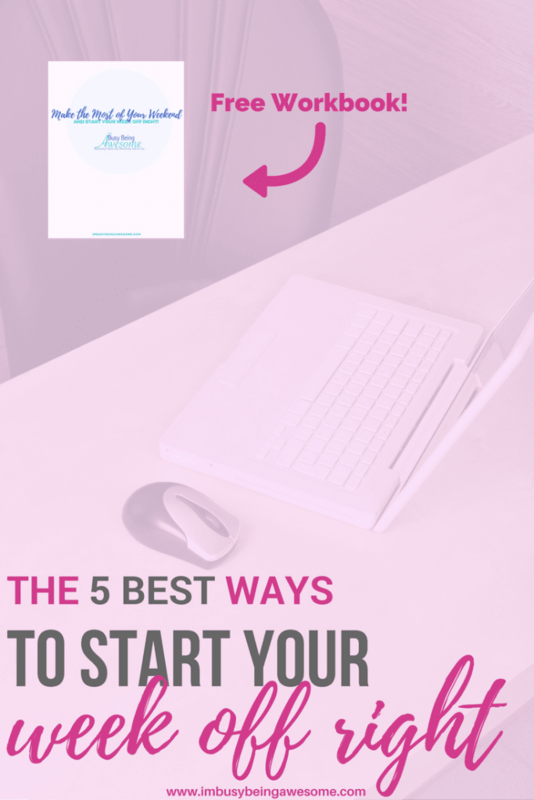 Always providing inspiring and actionable tips! Thank you, Belinda. I appreciate that! I really enjoyed your post about bad bosses today, too! Feeling all relaxed and ready for the week on a Sunday night is the best! I am trying to get better about doing a load of laundry at least every other day, with four people in the house we pile up dirty laundry like nobody’s business. I try to stick to my sleep schedule on the weekend, but yesterday I had a nap and it was glorious! I love planning, and it does make such a difference in the week!